Recently, Hubs and I accepted family friends’ offer to keep the hooligans on the condition that we get away someplace nice. Initially, we entertained the possibility of bed and breakfasts in quaint, rural spots. I nixed that idea when I thought about the possibility of rain. Aside: Mucking around in mud puddles is only romantic in movies. Instead, we opted for a city getaway – more specifically, the city fifteen miles from our suburban home. When two DC hotels that friends recommended came up at $400/night, we resorted to a different selection strategy. Hubs got out his iPhone and asked Siri for the nicest hotel within twenty miles. Aside: This sounds like the start of a very romantic trip, doesn’t it? Somehow the universe, or at least Siri, could give us the answer for a perfect getaway. I looked up the hotel online — 4 stars, over 9.2/10 customer rating, wine tasting hour, 1 ½ blocks from DuPont Circle Metro – and booked it. The first glitch came when Hubs and I started packing. Aside: Taking Metro into town sounded great. We could stroll through the quaint neighborhoods. With this in mind, I pulled out a rolling suitcase. What are you doing? Hubs asked. You’re going to take that thing on Metro? Can’t you just take a backpack? Can you borrow your daughters? You mean the pink and green butterflies from Pottery Barn Kids? We’re not backpacking across Europe, you know. I can’t show up at a four-star hotel with a child’s backpack. Suffice it to say, Hubs located a smaller rolling suitcase, which I lugged up and down escalators while trying to recover from the noxious train fumes. We arrived at the hotel where men in uniforms greeted us and held doors. Keys in hand, we rode the elevator to the eighth floor and rolled through the halls. “The décor’s rather masculine,” I commented as Hubs unlocked the door. Inside the room, I studied a faux animal fur throw blanketing the foot of the king size bed with leather headboard towering above the mattress and illuminated night stands flanking it. 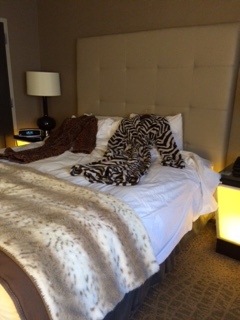 I opened the closet, expecting white terry cloth robes, but instead found one zebra print and one leopard print robe, both size L.
Zebra or leopard, my dear? “Which do you want?” I asked Hubs, thrusting the items towards him. After a brief nap, during which Hubs watched college football with the TV on mute, we consulted our phones for dinner options. The search results overwhelmed us. Maybe we could just stroll the neighborhoods and find a good spot. On the street, we stopped to read menus on restaurants located in quaint row house until we heard a man yelling obscenities at a Metro official. Aside: Suddenly, it seemed like a good idea to join the wine-tasting hour in our hotel lobby and consult our phones to locate one of DuPont Circles’ famed restaurants. Inside the lobby, there were approximately three men for every woman. Nearly everyone spoke Slavic languages. Aside: I realized that we weren’t the average patrons for this hotel about the time it dawned on me that we were in DuPont Circle on a Saturday night with no reservations for a Zagat-rated restaurant. We were hungry and not huge on small talk, so Hubs and I returned to the sidewalk with a new resolve to try the Indian restaurant we had passed even though we couldn’t find it on Trip Advisor. When the server/co-owner arrived, Hubs ordered Riesling, his staple. Aside: I selected Pinot Grigio because it paired well with my shrimp entrée and because I like to pretend that I am more sophisticated than Hubs. It wasn’t, but he didn’t want to deal with the language barrier that had led to the error. This wasn’t the getaway I had envisioned, but I couldn’t fix that, so instead, I stood up and wandered over to the six bottles of wine displayed on a counter representing the menu selections. When the server saw me, she came over. The correct glass of wine arrived, as did the ho-hum food. Later inside our hotel room, I scoured websites for local attractions, vowing to salvage Sunday. After brunch at a local spot, we walked past mansions displaying flags and tried to guess which country each represented until we arrived at the Woodrow Wilson House. Inside, we viewed a 15-minute film about his presidency. European statesmen credited Wilson with bringing an end to WWI and adopted his idea for the League of Nations during the Treaty of Paris. Despite his hero-status abroad, Wilson was unable to convince Congress to join the group. His greatest achievement as a statesman was rejected at home. After the film, Hubs and I toured the house. The highlight for me was seeing the coat made of kangaroo with a wombat collar, a gift to Wilson from a European admirer. The tour guide pointed out pictures of Wilson wearing the coat and commented that no other American president had a coat quite like this one. While I studied the coat, I tried to picture him wearing the thing to Washington events. Did Mrs. Wilson ever try to make him wear something more conventional? Maybe he, like us, was simply in the wrong place.